Of Wildflowers & Ephemeral Beauty . . .
Is there anything lovelier than the unexpected surprise of wildflowers, scattered along a woodland path? 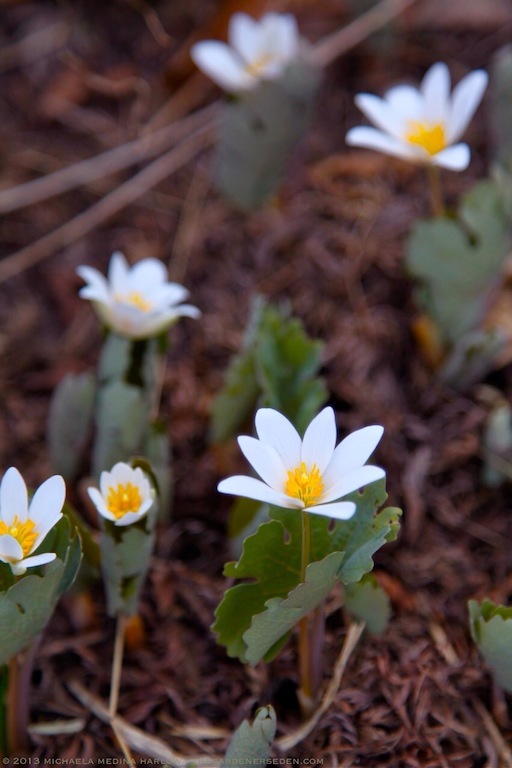 My heart leaps like a little child at the sight of nodding Trout Lilies (Erythronium americanum), and snow-white Bloodroot (Sanguinaria canadensis), poking up like a miracle from bare ground. 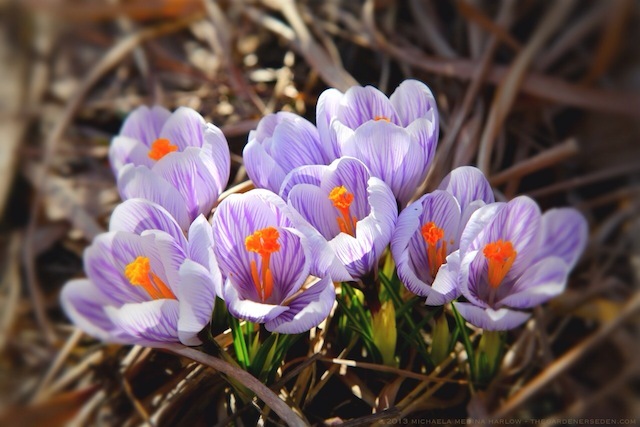 The fleeting nature of Spring’s exuberant, floral welcome makes it all the more precious; particularly in cold, northern climates with short summers and long winters. 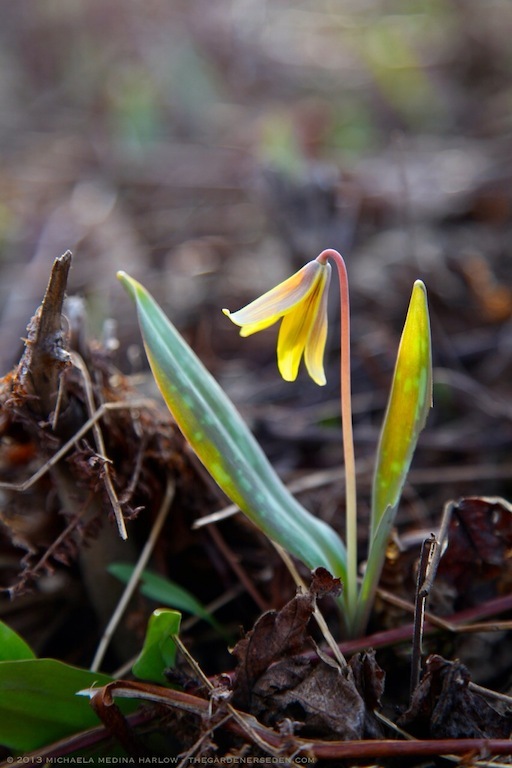 At last, the wildflowers have returned —along with spring peepers and melodious songbirds— and we greet them with all the excitement due long absent, and dearly loved friends . . . 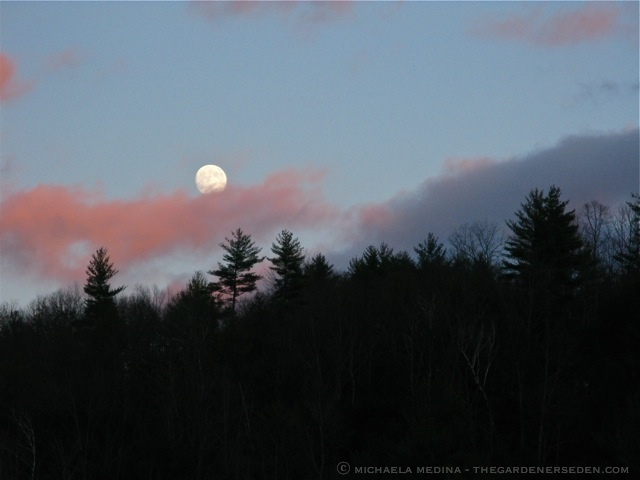 Pretty in Pink: April’s Full Moon . . .
Be sure to keep watch for the Pink Moon rising tonight, April 25th, at 7:52pm ET. And if you’re up with the songbirds, as I am, you can also catch our lovely celestial neighbor as she sets, at 5:32am ET, tomorrow morning, April 26th. For more magical Pink Moon facts and fancy, visit Space.com, here. As organic vegetable gardeners, we know how important it is to become familiar with the various plant families and to develop an understanding of how they relate to one another in the garden. Botanical knowledge is key to avoiding many pests, diseases and cultural problems. Having recently reviewed the topics of crop rotation, companion planting and intercropping in the organic vegetable garden —Kitchen Garden Planning, Part One, followed by Kitchen Garden Planning, Part Two— now seems like the perfect opportunity to discuss how this same botanical knowledge can guide creative use of homegrown produce in your kitchen. 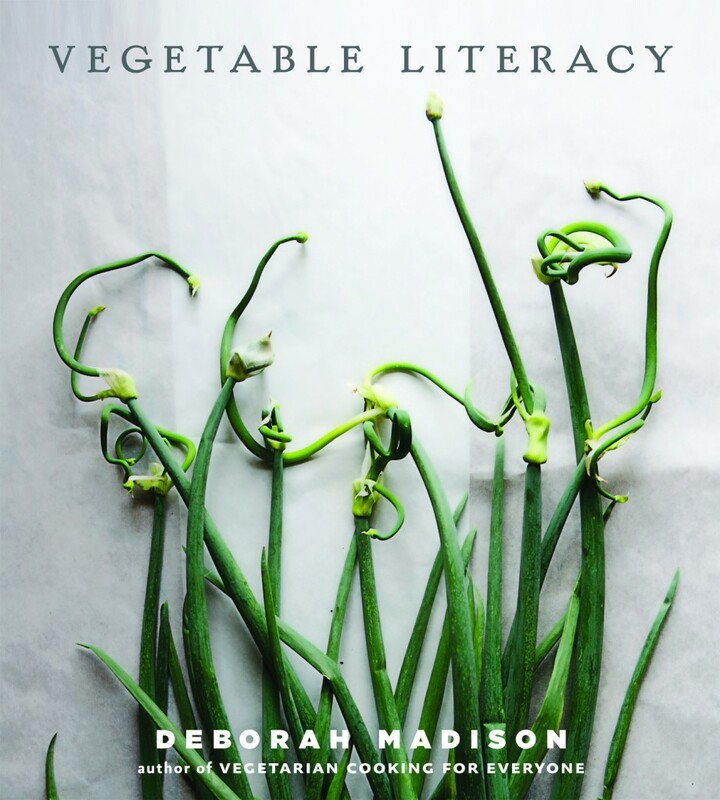 Over the past few weeks, I’ve been devouring Deborah Madison’s Vegetable Literacy, sent to me for review by publisher, Ten Speed Press. One of the most highly-regarded vegetarian cooks of our time, Deborah Madison is author of eleven cookbooks. In her most recent title, Madison explores the relationship between botany and cooking, and how that knowledge can serve us as we prepare produce in our kitchens. A new gardener herself, the author takes a down-to-earth approach; with stories and observations that will be both familiar and inspirational to those who, like Madison, are just beginning to grow their own food. More experienced green thumbs will be delighted by new botanical discoveries and unexpected, creative ways to use the fruits of their labor. New gardeners will quickly observe that some natural companions in their potagers —tomatoes and basil or garlic and potatoes, for example— are also delightful partners in recipes. In fact, the joy of experimenting with garden fresh ingredients in the kitchen is often what leads a gardener’s hands to soil in the first place. By learning the ways in which edible plants relate to one another, a gardener can become a more versatile and confident cook. Out of onions, spinach or some other key ingredient and need a quick substitute? Looking for a way to jazz up a simple plate of carrots, but haven’t a clue what might work with them? 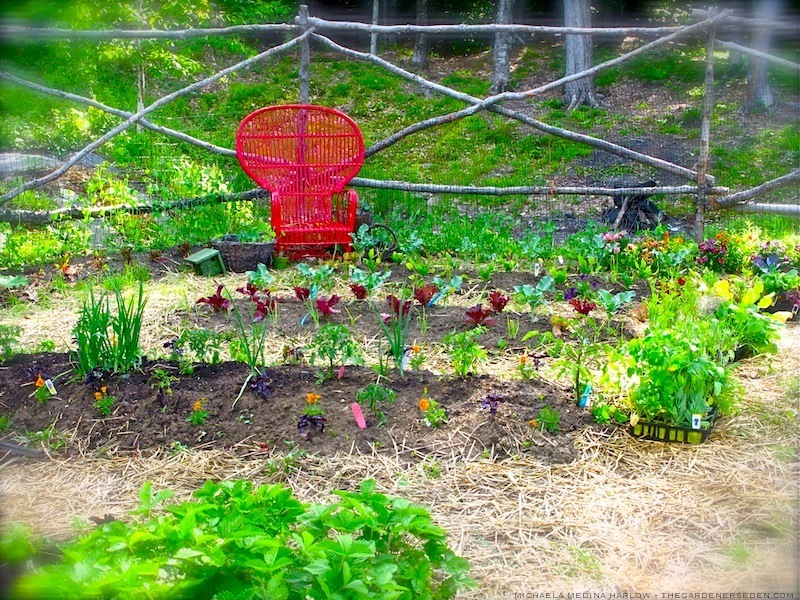 With a bit of coaching from Madison, gardeners may find the creative answers to these culinary challenges, right in the backyard vegetable patch! Filled with delicious, vegetarian recipes and gorgeous, full-color photographs, Vegetable Literacy is as beautiful to behold as it is delightful to read. Chapters in this cookbook are divided by plant families (Apiacea, Lamiacea, Asteraceae, Brassicaceae, etc.). In addition to 300-plus recipes, the author has included a chef’s notes about her favorite varieties of each edible plant, as well as interesting and useful botanical details for gardeners. I’ve flagged a number of dishes to try with my early crops, but the one featured below, “Peas with Baked Ricotta and Breadcrumbs”, simply couldn’t wait. Although it’s a bit early here in Vermont for garden-fresh peas, I did try this recipe with some of last fall’s bounty (stored in my freezer), and was thrilled with the result. I can’t wait to enjoy this comforting dish again; only next time, with the incomparable flavor of hand-shucked peas, plucked straight from my garden . . .
Heat the oven to 375°F. Lightly oil a small baking dish; a round Spanish earthenware dish about 6 inches across is perfect for this amount. When the cheese is finished baking, heat the butter in a small skillet over medium heat. When the butter foams, add the shallots and sage and cook until softened, about 3 minutes. Add the peas, 1/2 cup water, and the lemon zest. Simmer until the peas are bright green and tender; the time will vary, but it should be 3 to 5 minutes. Whatever you do, don’t let them turn gray. Season with salt and a little freshly ground pepper, not too much. Divide the ricotta between 2 plates. Spoon the peas over the cheese. Grate some Parmesan over all and enjoy while warm. With Pasta: Cook 1 cup or so pasta shells in boiling, salted water. 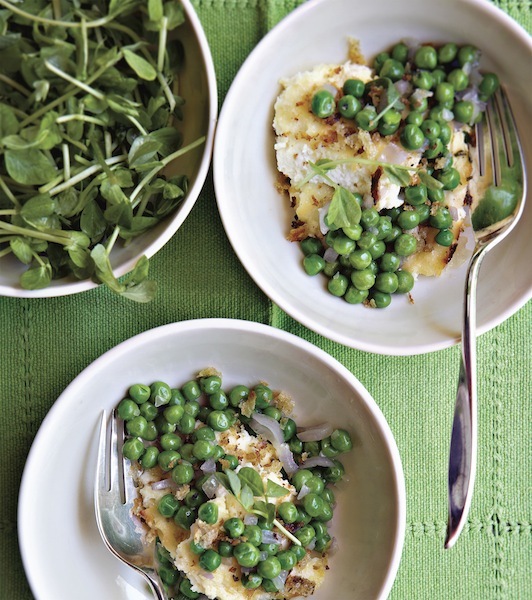 Drain and toss them with the peas, cooked as above, and then with the ricotta. The peas nestle in the pasta, like little green pearls. Reprinted with permission from Vegetable Literacy by Deborah Madison. Copyright © 2013 by Deborah Madison. 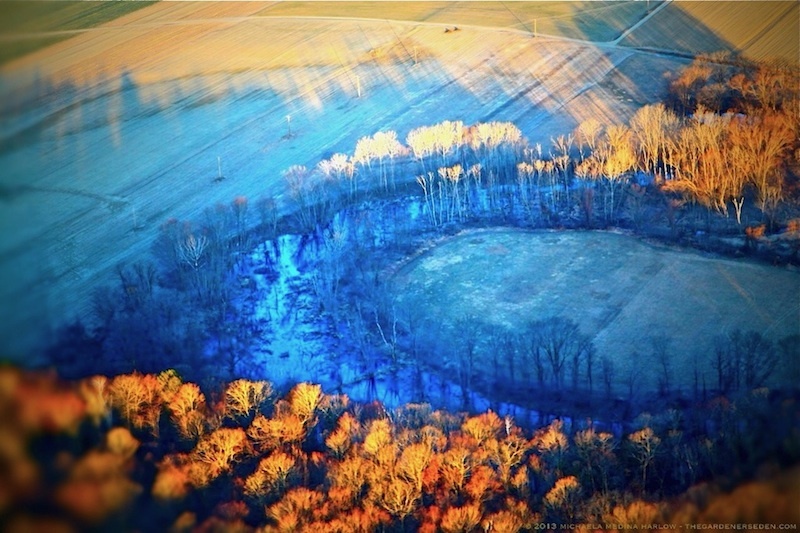 Photographs © 2013 Christopher Hirsheimer and Melissa Hamilton. Published by Ten Speed Press, a division of Random House, Inc.
All Other Photography & Text ⓒ Michaela Medina Harlow/The Gardener’s Eden. All images, articles and content on this site (with noted exceptions), are the original, copyrighted property of The Gardener’s Eden and may not be reposted, reproduced or used in any way without prior written consent. Contact information is in the left side bar. Please do not take my photographs without asking first. Thank you! 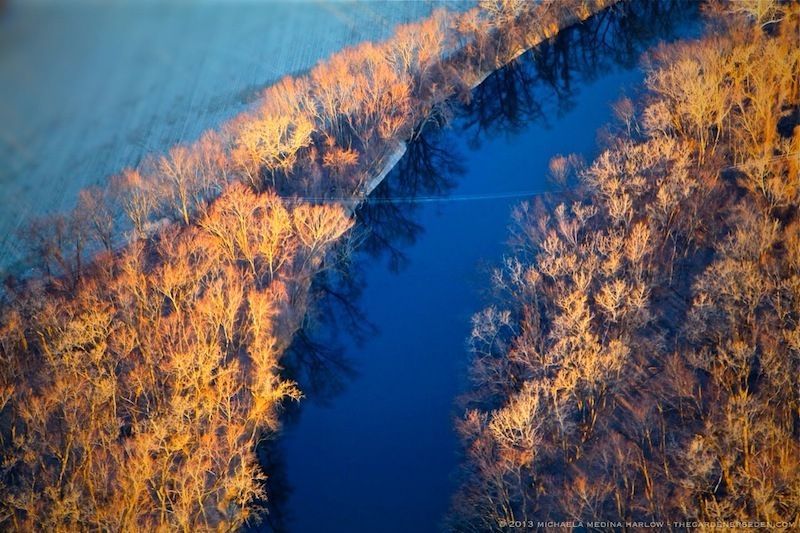 For the Love of Mother Earth . . . 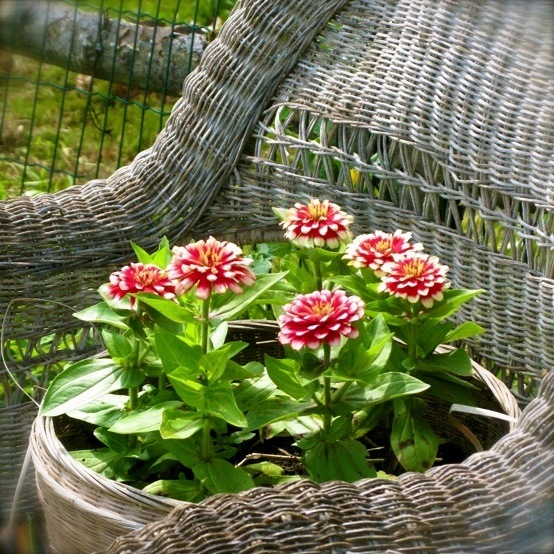 In the Company of Friends: My Potager is Planned for Companionship! Fresh air, sunshine, a cool drink and a warm, cozy spot in the garden, surrounded by friends; I can’t imagine a better way to spend my summer days. Turns out, plants feel much the same way we do. Like humans, plants tend to grow, thrive and produce best when they are provided the conditions and companions they prefer. 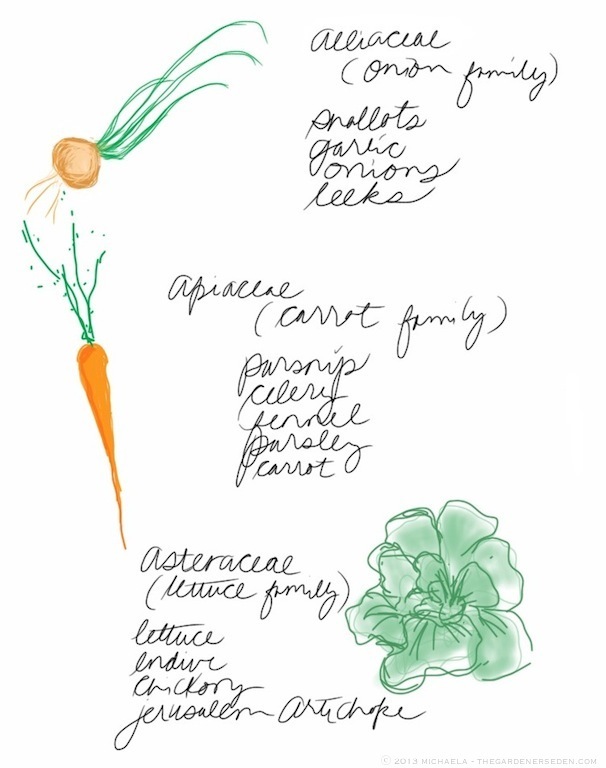 Given the varying needs and desires of the fruits, herbs and vegetables on this year’s garden party guest list, I like to give the seating arrangement a little thought. 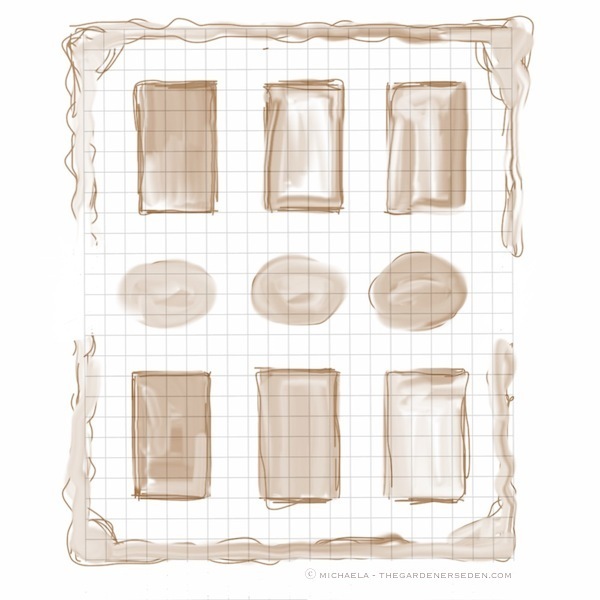 Every spring, when it’s time to design and layout my potager, I pull out my garden journal and a fresh sheet of 1/4″ graph paper to sketch my seasonal planting beds. 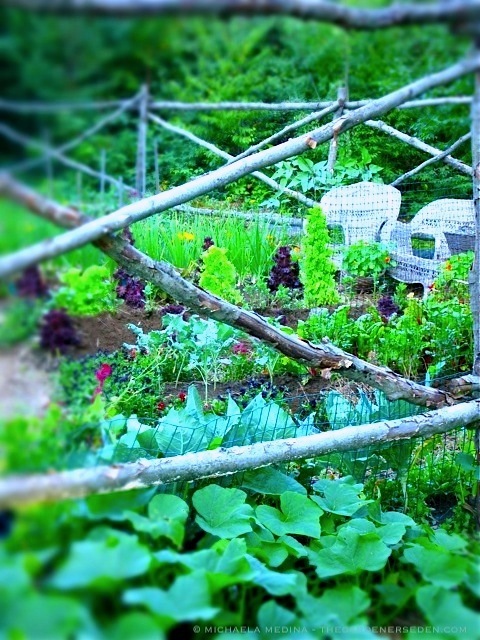 Now is the time to decide what crops I want to grow in my vegetable garden this year. 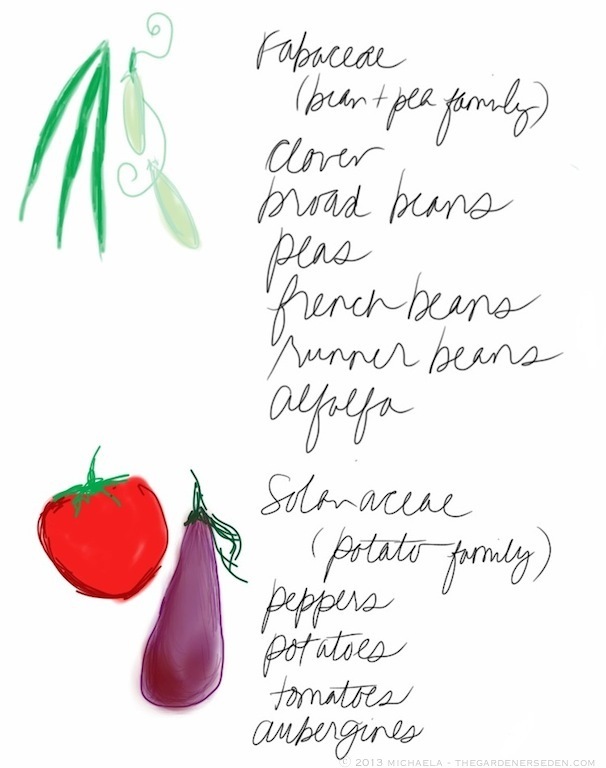 First I list my favorite cold crops and then the summertime fruits, herbs and vegetables (see lists below). I also like to replant certain fast-maturing crops —such as lettuce, peas, beets and carrots— for autumn harvest, so I make a note to remind myself to sow again in late summer. When I head to the garden center to pick up my seed and six packs, I take my garden journal —or a copy of my client’s plan and plant list— along with me for reference. 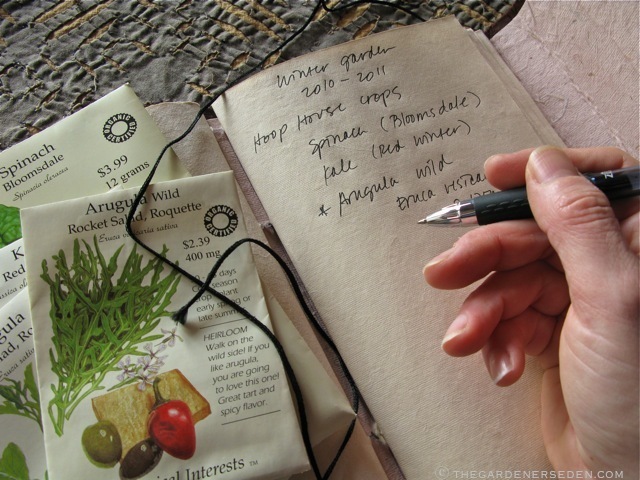 In my previous post —Kitchen Garden Planning, Part One— I mentioned the importance of a keeping a garden journal from year to year. 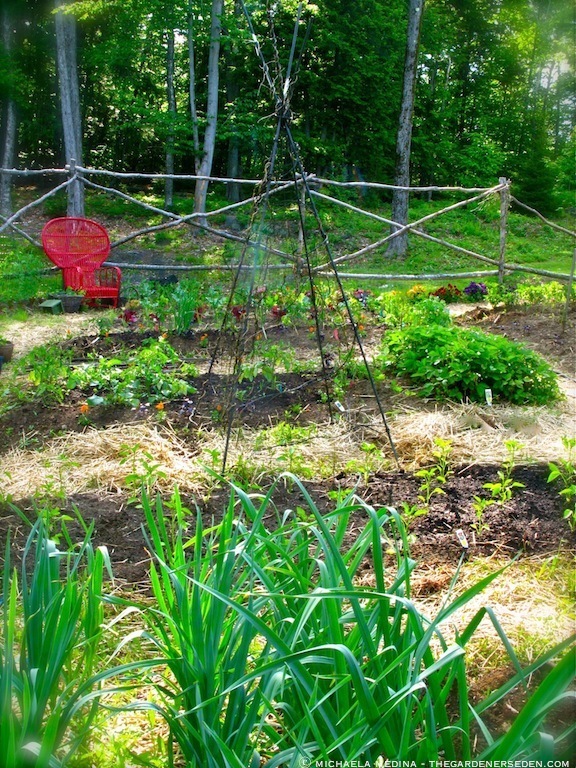 One of the keys to successful, organic vegetable gardening is crop rotation. Insect pests and diseases can be diminished by planting vegetables from the same families —see the basic groupings below— in different locations each year, following a three year cycle. 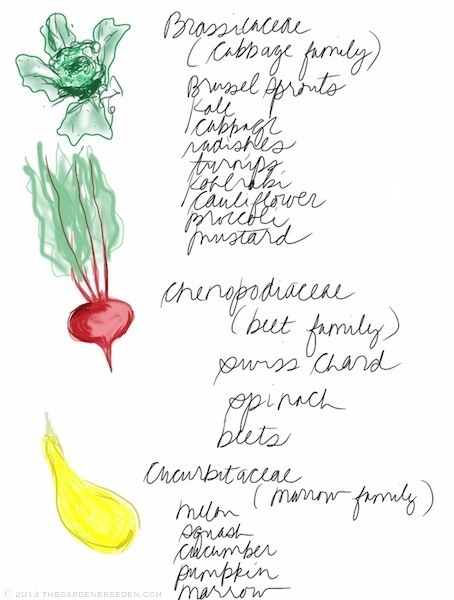 Here’s a simplified list of vegetable families to serve s a basic rotation guide, from Cornell’s Cooperative Extension Service Online. Avoid planting the same vegetables —or those within the same families— in the same spots next year by keeping a record of what is planted where, this year. 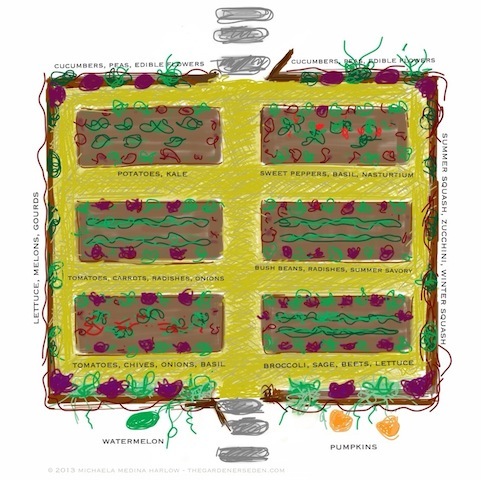 In addition to assisting with crop rotation, laying out a garden plan on grid paper can help to maximize available area; particularly in small gardens, where space is at a premium. Keeping diagrams and written records of where you have sown/planted what vegetables can assist with intercropping (planting different herbs, fruits, flowers and vegetables —such as basil, carrots and tomatoes— within the same beds, instead of planting long rows of just one kind of vegetable), and succession planting (repeat sowing quick-to-mature crops like lettuce, peas and spinach). By continuously replanting and filling all voids, weeding tasks are reduced and high yields can be obtained from even the smallest garden. When laying out my annual vegetable garden, first I list my favorite cold crops and then the summertime fruits and vegetables. Mesclun greens, arugula, lettuce, chard, beets, carrots, radishes, broccoli and peas? Those all-time favorites are definitely on my spring planting list. I also like to replant certain crops for a late autumn harvest. 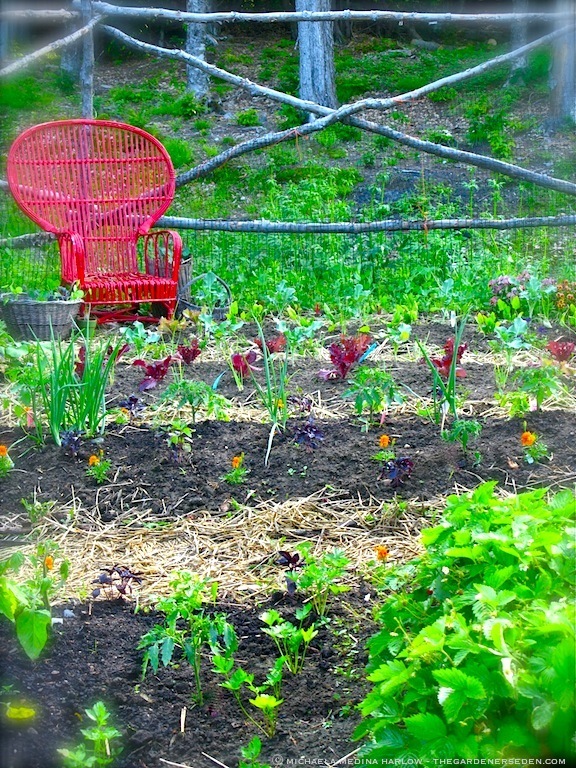 Fast-maturing, cool-season crops —such as lettuce, peas, radishes, spinach, beets, broccoli, lettuce and others— can be planted early in the growing year and repeat sown over the course of several weeks (succession planting), or replanted later in the season for autumn harvest, making use of newly open space as crops mature throughout the summer. Next, I need to think about the summer crops, and plan space for those as well. 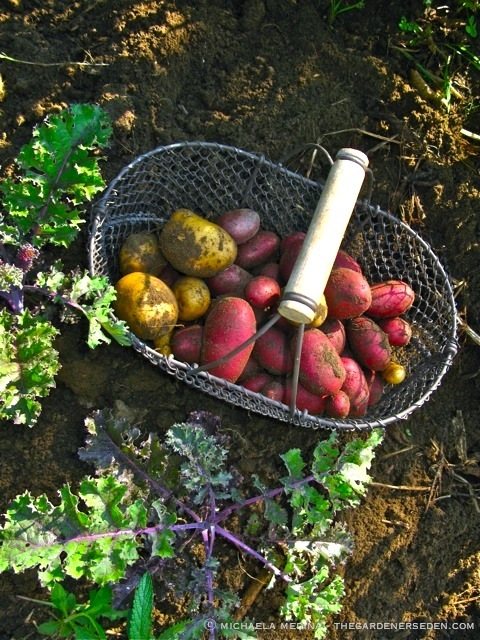 Some warm season crops can be planted earlier in the season than others; think potatoes and onions. Once the threat of frost has passed, I’ll plant summertime favorites like tomatoes, basil, zucchini, squash, melons, sweet and spicy peppers, all kinds of beans, cucumbers, pumpkins and gourds. Keep in mind that the growth of warm-season and slow-to-mature crops can be assisted by intercropping with helpful companions. Some of the more common cool and warm season crops, and good companion plants for interplanting, are listed in the illustrations above, and below. Many flowers and herbs have protective properties that keep pests and diseases to a minimum my vegetable garden. For example, sage (Salvia officinalis) is protective to Brassicaceae (cabbage family), against the cabbage butterfly and to Apiaceae (carrot family), against carrot fly. Try growing herbs in an amongst vegetables, rather than separated in an herb garden. 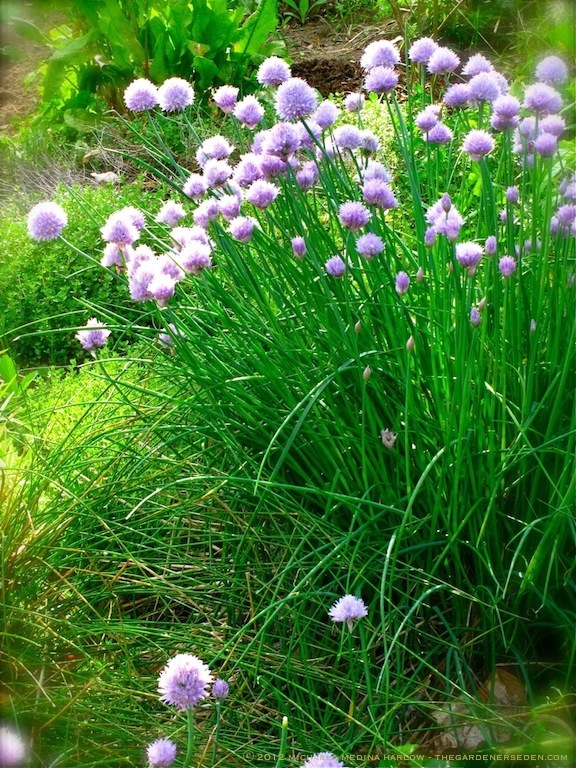 Flowering herbs will also attract pollinators, which help nearby fruits. In addition to providing beauty and assisting with pollination, growing flowers, such as marigold (Calendula), can help deter pests like eelworms (plant-parasitic nematodes). Interested in learning more about the benefits of companion planting and intercropping? I own and highly recommend Louise Riotte’s Carrots Love Tomatoes: Secrets of Companion Planting for Successful Gardening, and Ed Smith’s The Vegetable Gardener’s Bible. Photography, Illustration & Text ⓒ Michaela Medina Harlow/The Gardener’s Eden. All images, articles and content on this site (with noted exceptions), are the original, copyrighted property of The Gardener’s Eden and may not be reposted, reproduced or used in any way without prior written consent. Contact information is in the left side bar. Please do not take my photographs without asking first. Thank you! 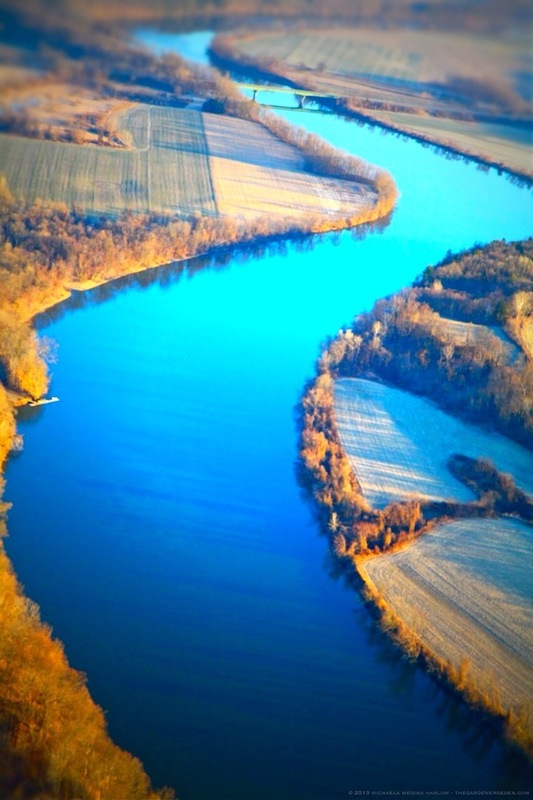 Up before sunrise to catch dawn’s honey-gold light, last Friday morning I toured the early April landscape beneath the wings of an agile Citabria. 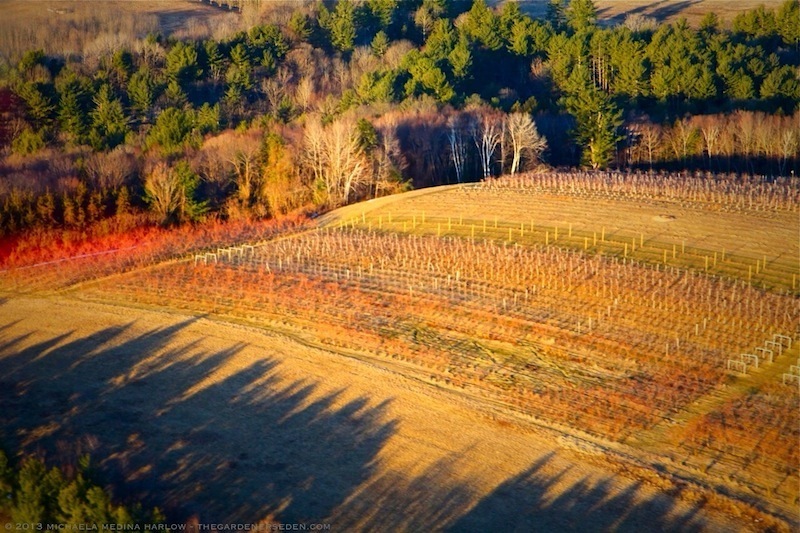 As we climbed to altitude, a haze of sheer, radiant color —violet, cherry, gold and willow— illuminated treetops and hills as the low sunlight cast shadows, long across the chartreuse-tinted fields. 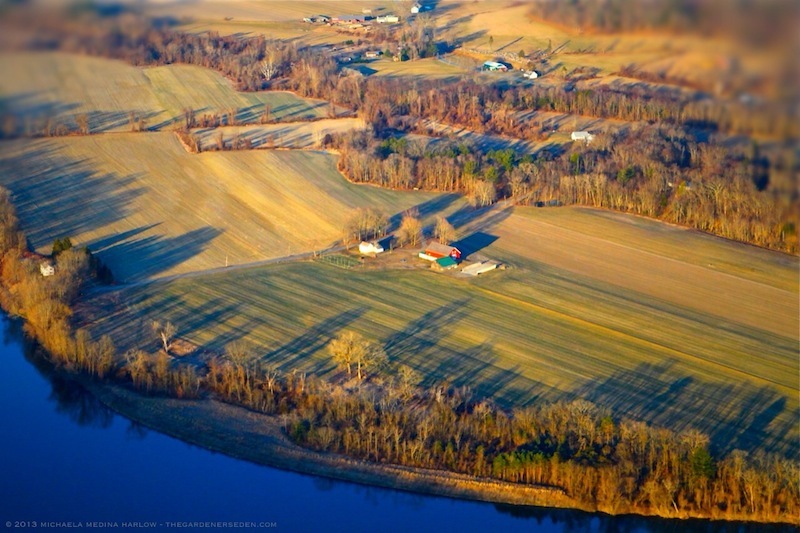 Like a fine, pastel tapestry, flung across the valley floor, the springtime earth shimmered and glistened below us. 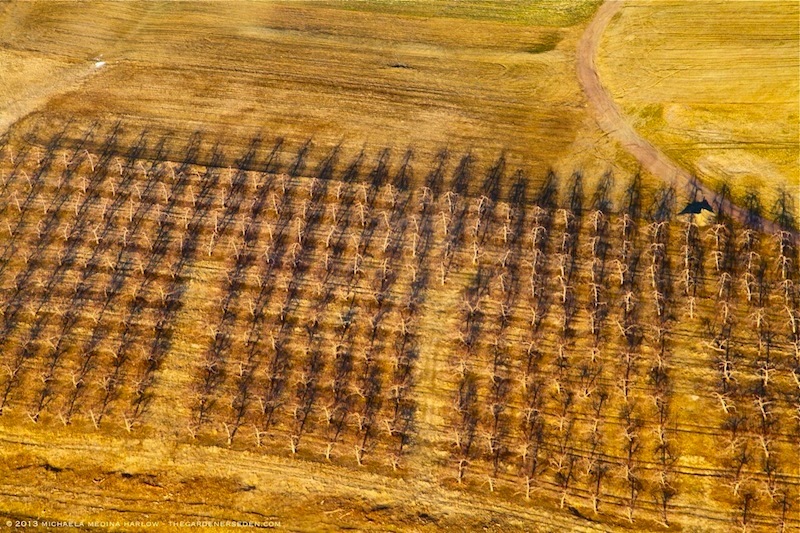 Gnarled apple trees, dramatic with freshly sculpted forms, stood out in stark contrast to the muted tones of tawny land. It was a glorious morning inside the sky; filled with the promise of a bright, new season and finally —receding into the shadows— the last ghostly whispers of the one before . . .
There’s still snow in my vegetable garden, but with sunny days and drying wind, it’s melting quickly. I try to stay in the moment and enjoy the season as it unfolds. But I must confess that I can hardly wait to get back into my garden and sink my hands down into the rich, dark, fragrant earth. April through late November, I spend a great deal of time working in my kitchen garden. So, I’ve made the space welcoming and comfortable by adding room to relax; placing comfortable chairs here and there, and conveniently positioning a table to set down my coffee cup or indulge in a late afternoon snack. In fact, I treat my edible garden as I would any other outdoor room; enclosing the cozy space with a rustic, sapling fence and decorating with hand-woven teepees for climbers, pots for edible flowers and wicker baskets for weeding. I can’t imagine a more pleasant place to spend my weekend hours. Tending the beds in my pretty potager never feels like a chore. 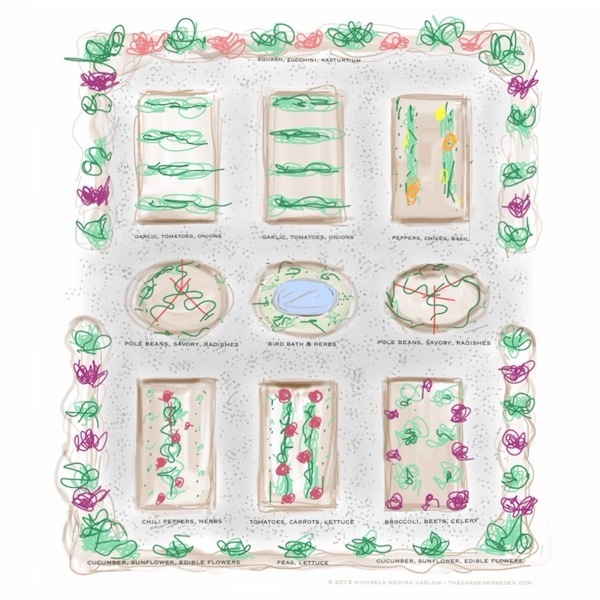 I’ll be talking more about kitchen garden design next Saturday (April 13th – 10am with Jack Manix), at Walker Farm’s first spring seminar, The Art and Science of Vegetable Gardening. For those of you too far away to attend this free event, I will be posting notes on the topic of edible gardens both before and after the seminar. 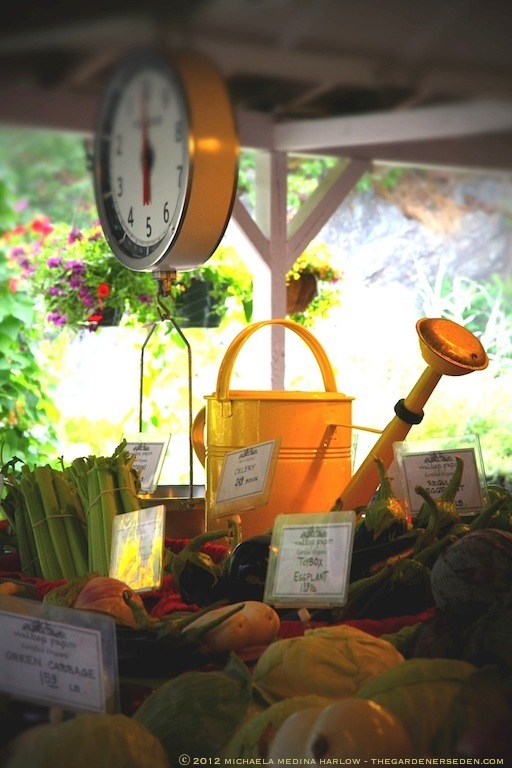 Whether you grow a few pots of veggies on your terrace or have an entire acre devoted to culinary delights, there’s nothing more important to your success than properly planning and regularly tending your garden. A handmade sapling fence is pretty to look, but it’s also practical for growing vertical produce like peas, melons, cucumbers. A tall fence also keeps out the white tailed deer, and green, coated chicken wire —extending from lower bar, below ground level— keeps out rabbits and burrowing rodents. The paths of my garden were lined with a weed-barrier of old cardboard and rug scraps. Of course no one ever notices my thrifty recycling with the pretty top layer of golden straw mulch. While there are individual crops suited to a wide variety of situations, most vegetables prefer full sun, good soil, excellent drainage and room to grow. 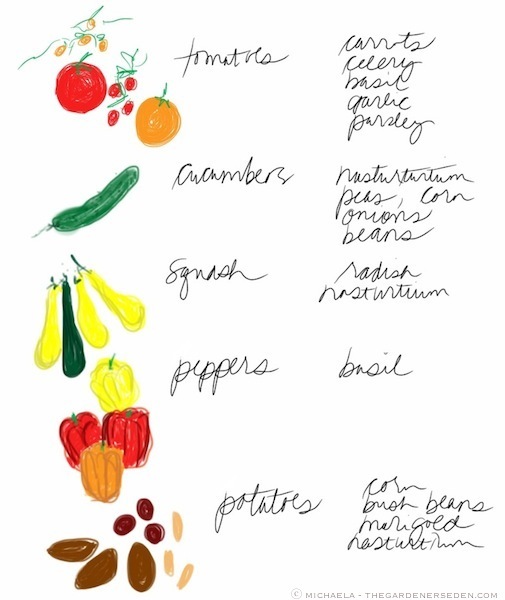 Choose your vegetable garden’s site accordingly. Shady yard? Consider growing leafy greens and herbs suited to filtered sunlight and head to the farmer’s market for your tomatoes. Poor soil or water-logged location? Raised beds or containers are the simplest solution. In fact raised beds —either natural, earthen mounds where drainage is good or constructed soil retainers built from rot-resistant wood or stone where it isn’t— are my preferred planting style for vegetable gardening in any location. The soil in raised beds tends to warm up faster in my cold climate and I like wide, deep beds —enriched with well-rotted manure and/or homemade compost— for growing a wide variety of crops. Always test your soil’s pH as well as N,P,K and amend accordingly with organic supplements. Read more about basic soil testing here. 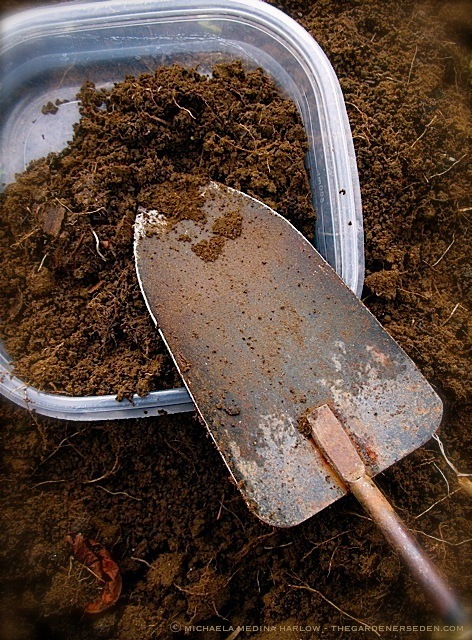 Testing your soil with a kit is quick and easy, and I recommend you do it at least once a year. Click here for details. If you think you need more information, you can send soil samples out to your local university extension service for more detailed analysis. 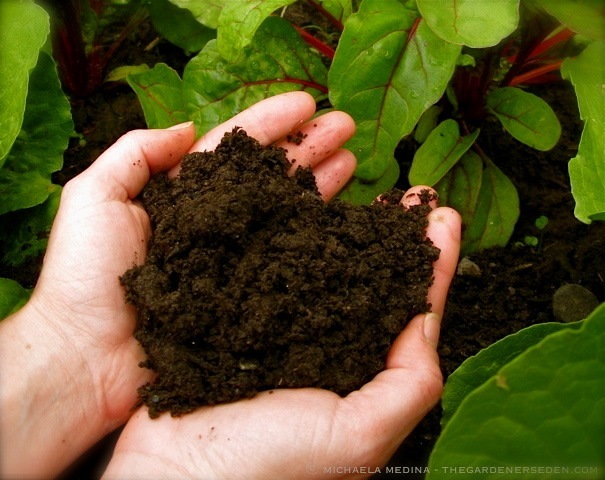 Making and using your own compost from kitchen scraps, lawn clippings and other organic debris is one of the easiest ways to improve garden soil. New to composting? You don’t need to spend a fortune on bins and tumblers, click here and travel back to my previous post on composting basics to learn or review the simple steps. 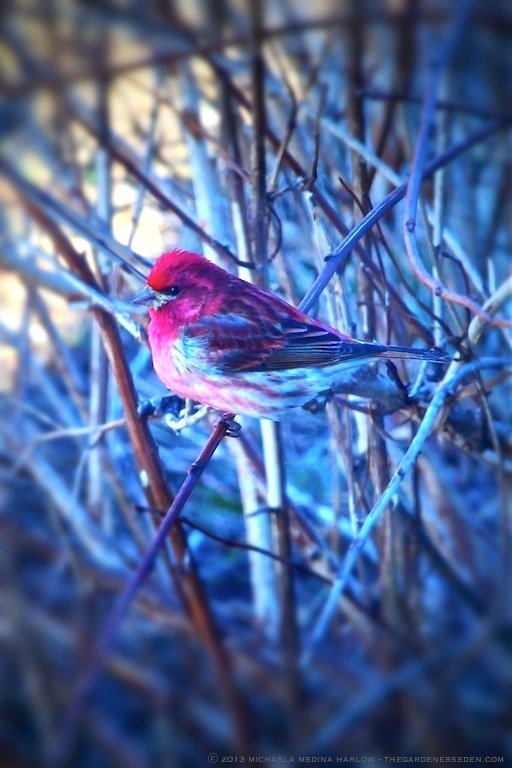 Flowers are attractive to beneficial birds and insects, as well as to our own eyes. Draw pollinators into your garden by adding flowering plants to your potager. If you grow edible blossoms, you’ll be able to enjoy both the sight and the taste of your blooms. Learn more about edible flowers in my previous post, here. 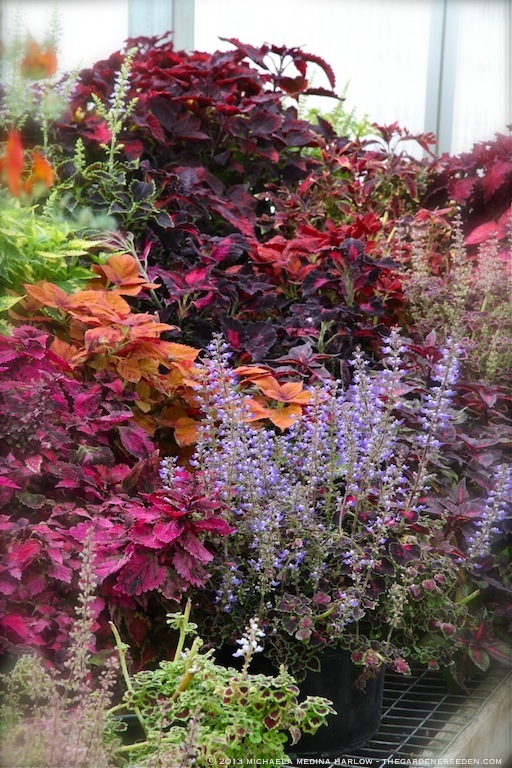 In addition to providing room-to-grow, wide beds provide extra growing space for pretty edging plants like herbs, edible flowers and tiny, alpine strawberries. More than merely decorative, herbs and edible flowers make great companion plants; attracting beneficial insects like bees and butterflies, and deterring or distracting a few of the less-than-desirables. I like to include annual flowers for cutting in my vegetable garden, where I can easily harvest a bunch for the dinner table while collecting produce. 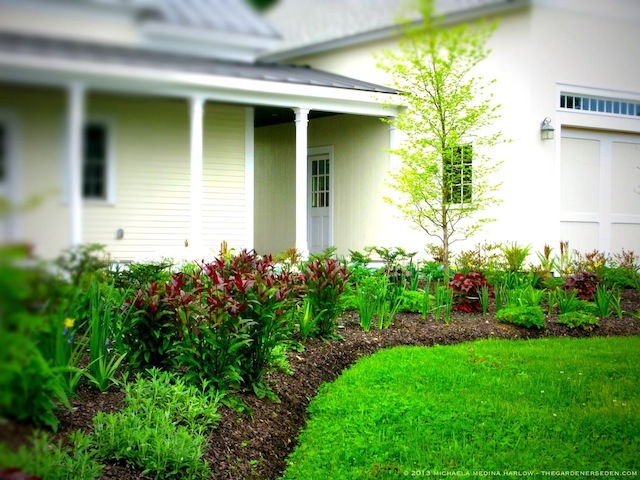 No room to plant flowers in your vegetable garden beds? 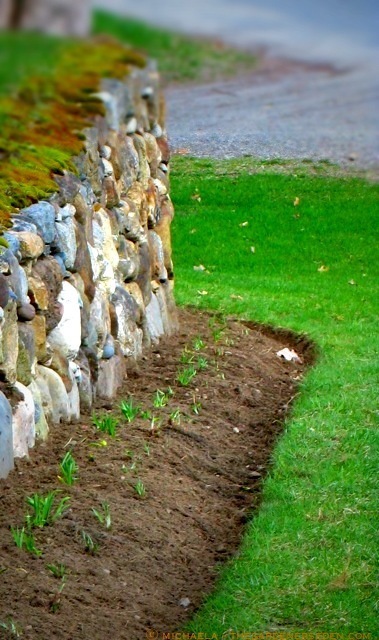 Consider scattering flower pots here and there at the ends of rows, the edges of pathways, or hang them from your garden fence or balcony rail with hooks. Drawing bees, hummingbirds and other pollinators to your garden will help your garden and the environment. If you grow edible blossoms, you’ll be able to enjoy both the sight and the taste of your blooms, but be sure to do your research before consuming any flower, as some are quite toxic. 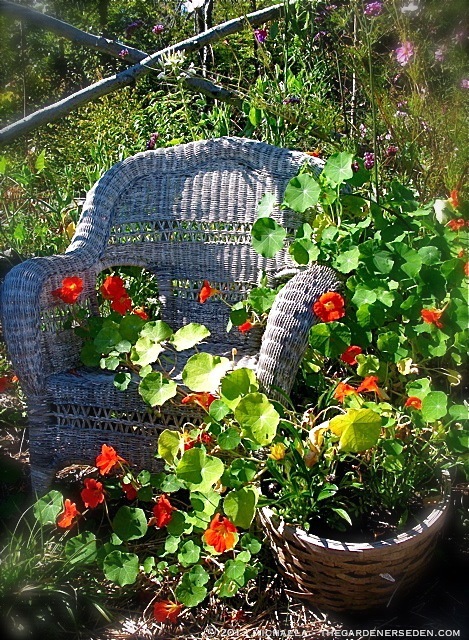 A few particularly colorful and safely edible additions for small spaces include pansies, marigold, nasturtiums and chives. Read more about edible flowers in my previous post, here. I love the flavor of homegrown potatoes, so I plant a pound or two of many different varieties; trying new introductions and long-forgotten favorites each year. This method allows me to have potatoes of all shapes, colors and sizes throughout the season while also providing a fall crop for root cellaring. Consider how you will use your produce —immediately, for storage or both— before you plan your garden and order your seed or shop for vegetable starts. Planting too many vegetables leads to over-crowding and smaller yields. Read more about potato varieties here. Before the gardening season moves into full swing, I like to consult last season’s journal before I layout this season’s planting plan on grid paper. Crop rotation in vegetable gardens helps to deter pests and diseases and can help to build and protect your soil. I avoid planting the same vegetables —or those within the same groups; such as those in the tomato family like eggplant, pepper, tomatillo and potato— in the same beds year after year. When rotating crops and planning this season’s garden, consider the plant family, height (for sun and shade considerations) and the nutrient demands of each crop. Avoid planting your tomatoes in the shade of cornstalks and in order to prolong the fertility of your soil, avoid planting heavy feeder crops —such as brassicas and tomatoes— in the same position year after year. 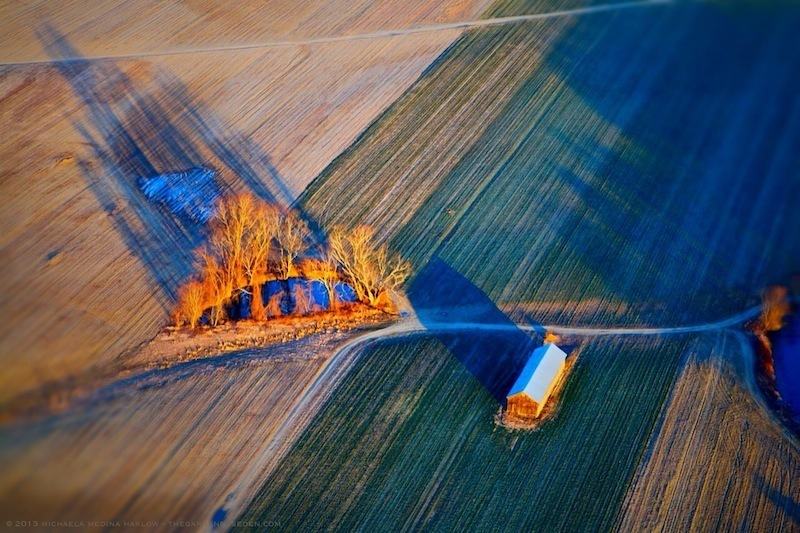 Rotate crops that require high fertility with legumes —such as peas and beans— or light feeders such as herbs and potatoes, or other root vegetables. 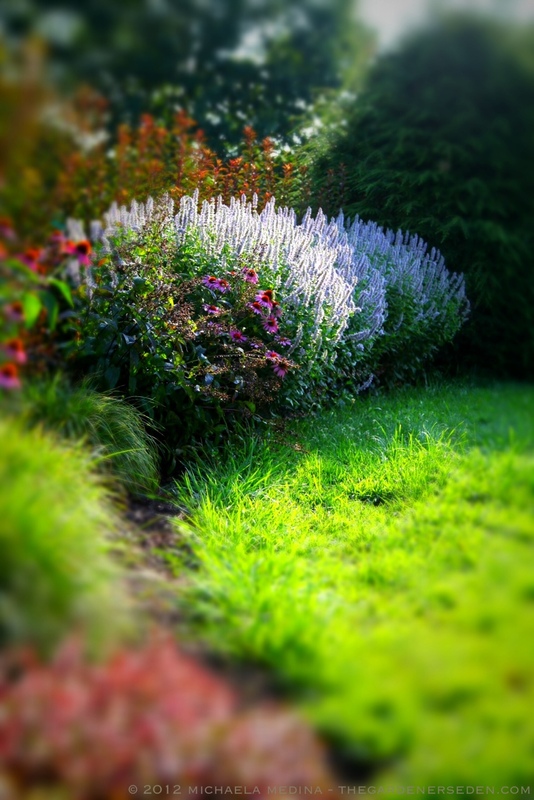 If you are building a smaller garden this year, and a vegetable bed or two fall out of use for a season, try to plant a green manure cover crop like buckwheat, alfalfa or winter rye to help build the soil and keep down weeds. 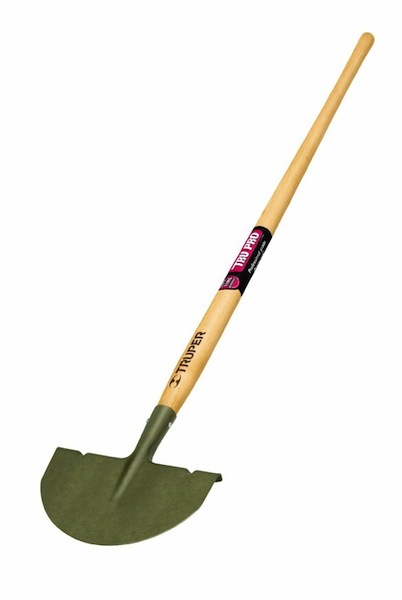 You can turn the green manure crop over with a hoe and replant the space with veggies or flowers next year. 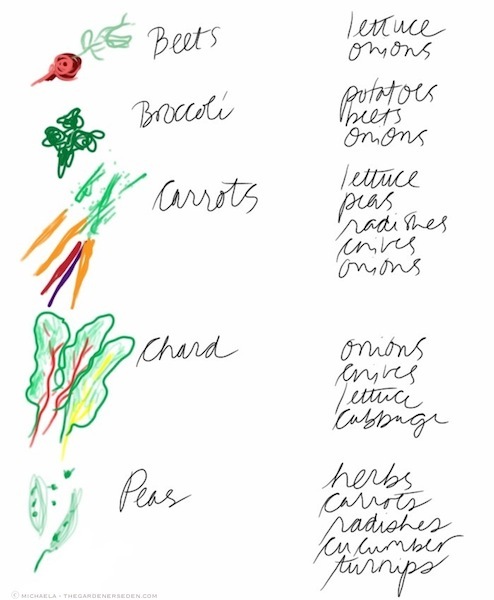 Keeping a record of my kitchen garden is more than just an excuse to buy a pretty, handmade journal. Taking notes on successes and failures as well as the position of various crops, provides essential information for my planting plan in following years. Read more about garden journaling here. In addition to the regular posts you will find here on the topic of potager design and planning, I have a few beautiful and inspirational books on edible gardening to recommend. 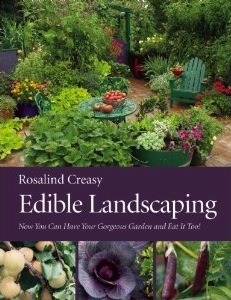 Rosalind Creasy’s Edible Landscaping (pictured above) is a great book, just chock full of gorgeous garden design photos and practical, inspirational ideas. 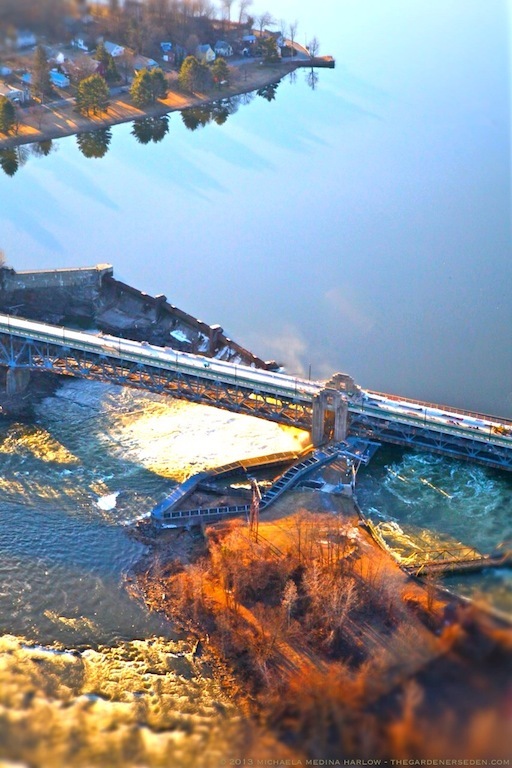 I mentioned it in this post (here), and I still highly recommend it. 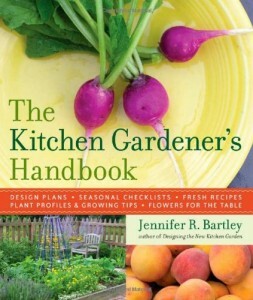 And Jennifer Bartley, author of one of my favorite potager design books, Designing the New Kitchen Garden, recently released another beautiful and informative title, The Kitchen Gardener’s Handbook, from Timber Press. If you are looking for inspiration, these titles will really get you going! Like most gardeners, I tend to celebrate the arrival of each season with favorite, annual traditions. 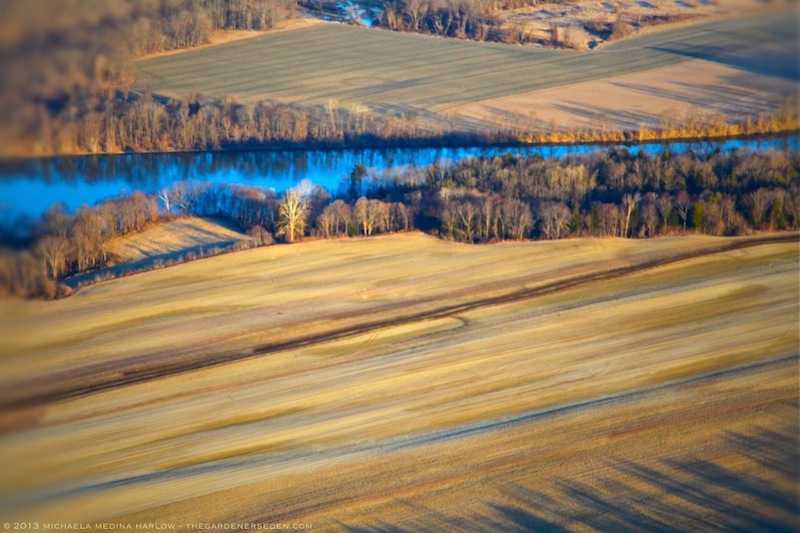 And for me, spring just isn’t spring without a visit to Walker Farm in nearby Dummerston, Vermont. The stand officially opens for the season today, Friday, April 5th, and there will be beautiful, cold-hardy pansies galore! 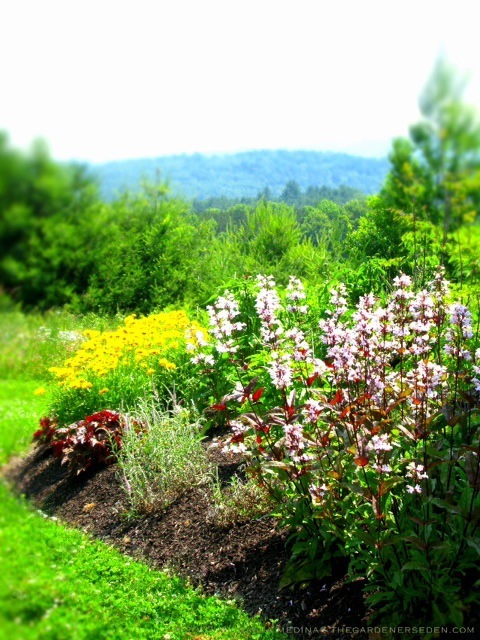 How lucky are we, in southern Vermont, to have such a world class, horticultural hub in our own backyard? 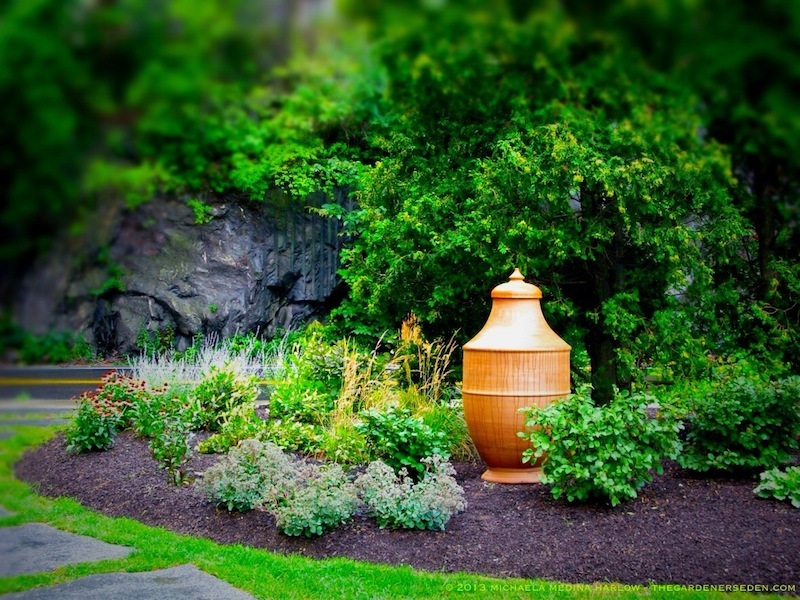 I stopped in last week for this spring’s garden seminar planning —scroll down or click here for a complete schedule of free events— and a tour of the gorgeous greenhouses with owners, Karen and Jack Manix. It’s always inspiring to visit Walker Farm at this time of year for a prelude to springtime and a sneak-peek at the season’s freshest offerings. 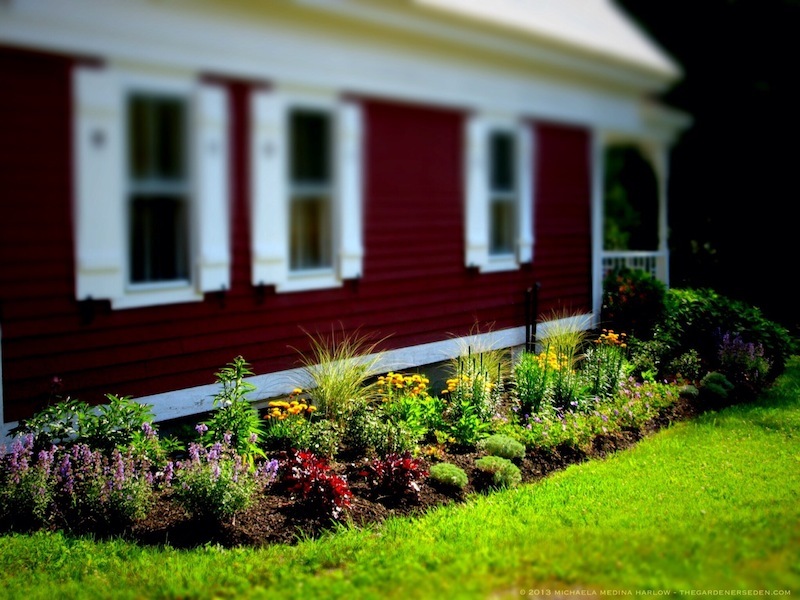 Pretty & Productive: Learn the Ins and Outs of Potager Planning & Planting at 10am, this Saturday, April 13th 2013 at Walker Farm, Dummerston, Vermont. Jack Manix and I Will Present, The Art & Science of Vegetable Gardening. Free and Open to the Public (please visit the Walker Farm website and email or call to reserve your spot for this popular event). 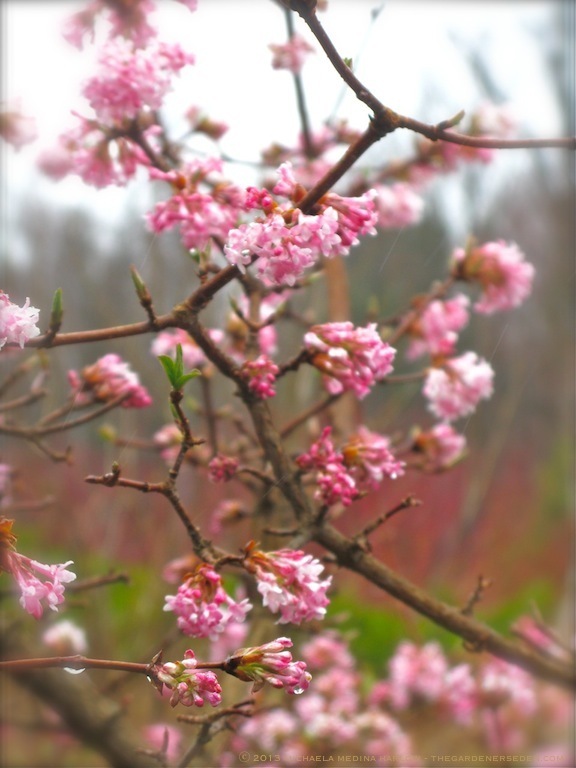 Each spring, Walker Farm generously sponsors a variety of free, inspirational and educational gardening seminars with topics to interest a wide range of gardeners, from the freshest novice to the most advanced green thumb. This spring’s series of seminars begins at the farm on Saturday, April 13th at 10am, with The Art & Science of Vegetable Gardening. Walker Farm’s Jack Manix will cover the science of vegetable gardening —some of the most important steps involved in setting up and maintaining a healthy kitchen garden— and I’ll be offering fresh design tips and creative ideas to help you create a beautiful and productive potager. This seminar, and all others offered this spring at Walker Farm, will be free and open to the public. However, seating at these events is limited to 30, so be sure to email or call the farm to reserve your spot. Please visit the Workshop page for more details and remember to check back for changes and/or additions/updates. 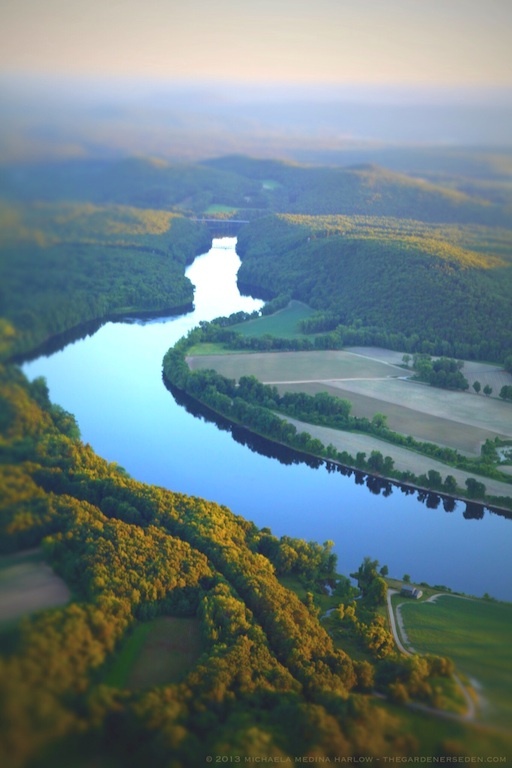 Walker Farm has been featured by numerous publications over the years —including The New York Times and Yankee Magazine— and their gorgeous grounds and greenhouses are frequented by gardeners from as far away as Boston and New York. 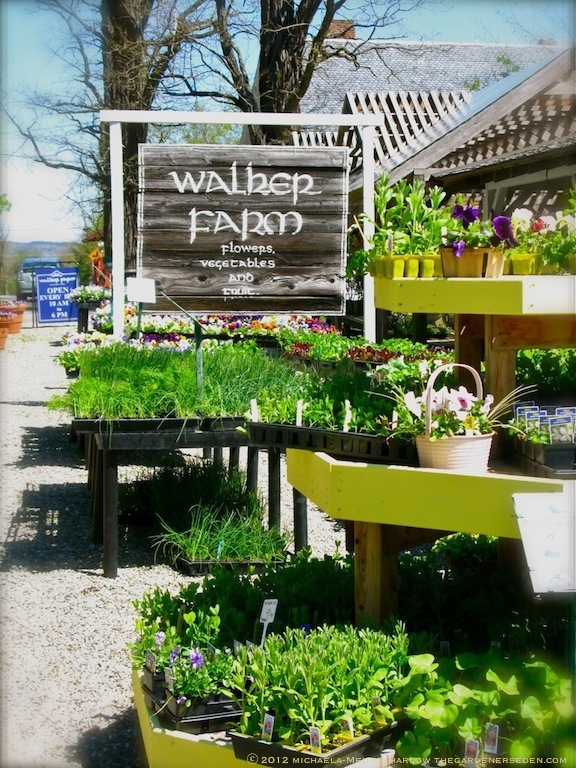 From organically grown berry plants and gourmet vegetable starts, to fruit trees and seed packets, Walker Farm is the place to go when shopping for edible gardens. And for the ornamental garden enthusiast, Walker Farm is a friendly-yet-sophisticated, designer-garden destination beyond compare. 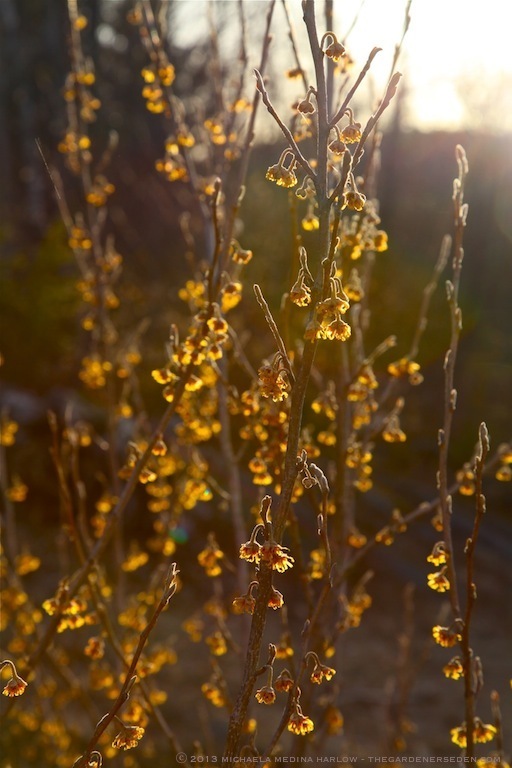 Here you will find unusual trees and shrubs —including exquisite, rare conifers— field-grown perennials and greenhouse grown annuals for the most discerning of connoisseurs. If a tour of the Walker Farm’s horticulture heaven doesn’t leave you dizzy with delight, the gorgeous containers and statuary in the potting shed, and heirloom-quality garden tools in the stand are sure to make any gardener swoon. 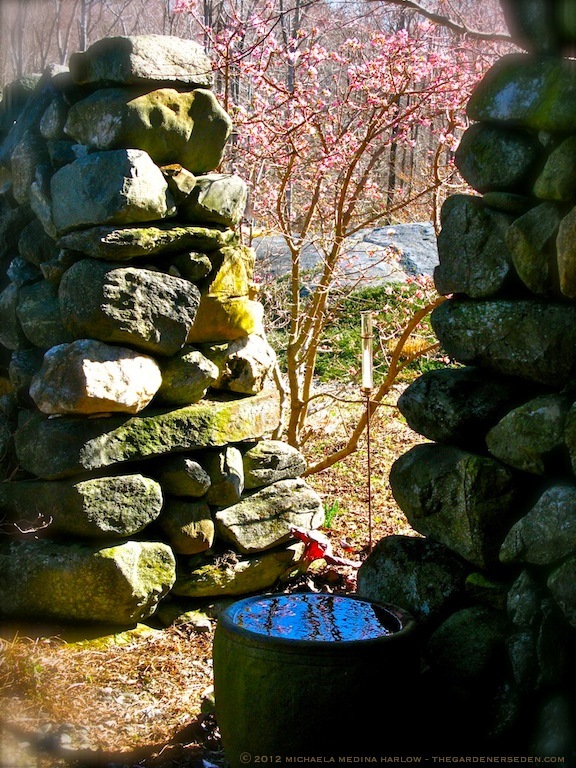 It’s April first, and foolishly —thinking that surely we’ve seen the last of snow— we’re tempted to rush forward with our early season chores. 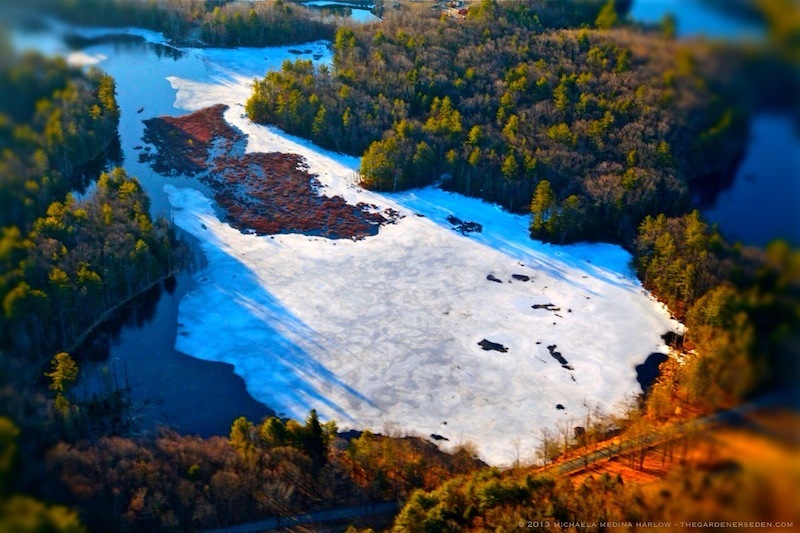 And then —often without the slightest provocation or warning— Spring turns a cold cheek. Over the years, I’ve learned that in early April, a weather forecast calling for rain usually translates to snow-showers. 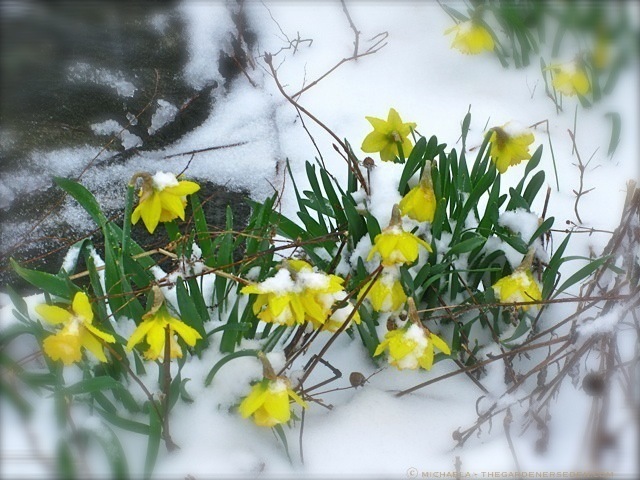 Yes, Spring can be rather cruel, yet we always anticipate her kindness. Perhaps she will gift us pastel flower petals, dusted in powdered sugar . . . Yes, it may still snow. 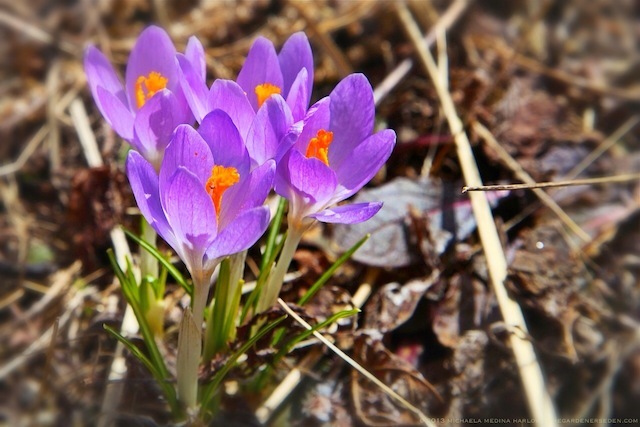 But in meantime, there are plenty of seasonal garden tasks to fill April’s weekend hours on warmer days. 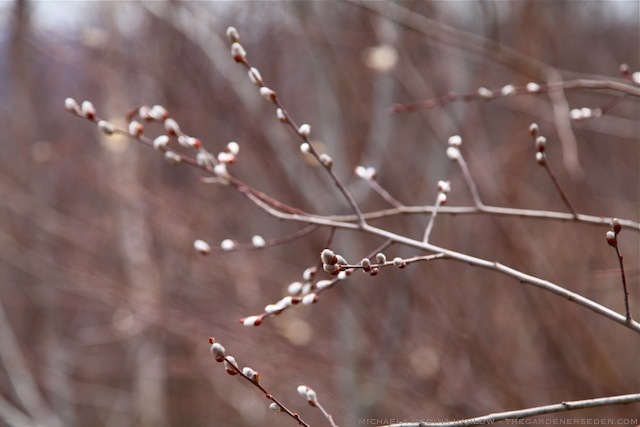 While walking along the garden paths on these early spring days, I often notice broken branches on shrubbery —revealed by receding snow— in need of pruning (click here for spring pruning tips), and in a few days I’ll begin cutting back ornamental grasses and crushed flower stalks along the front entryway. As ice melts away from the terraces, I tidy up the bird feeding stations, rake and then sweep the surrounding stone walkways. 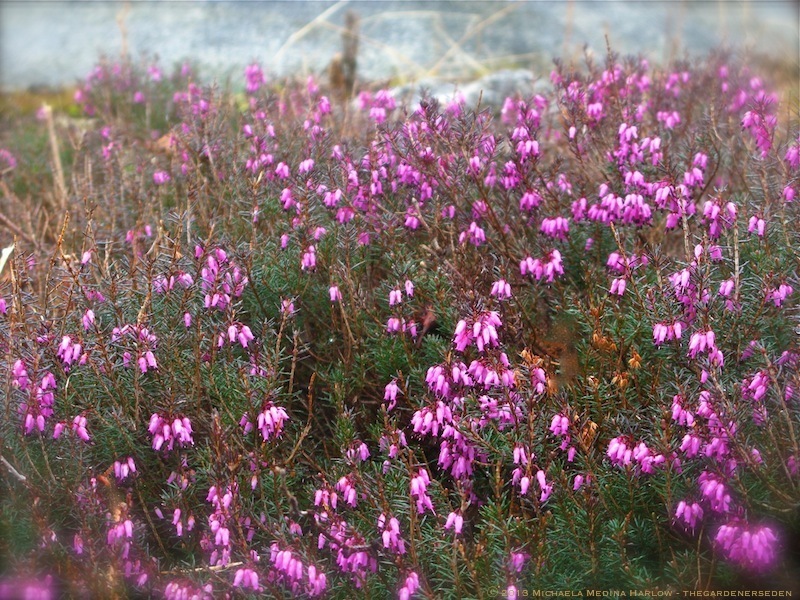 Spring Heath (Erica carnea), is one of the earliest flowers to bloom in my garden; sometimes covering the ledges with a hazy blush before the snow fully departs. 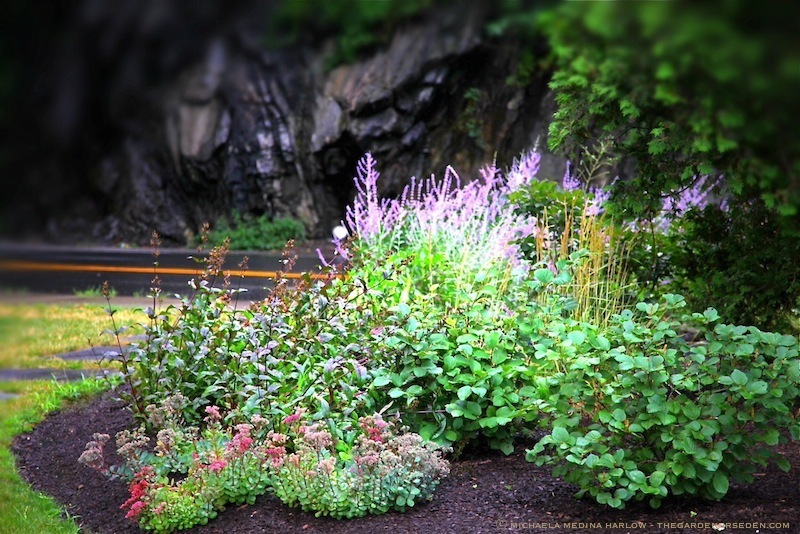 Click here to read my plant profile on this lovely, ground-cover for full sun. Of course, there’s plenty to do indoors as well. 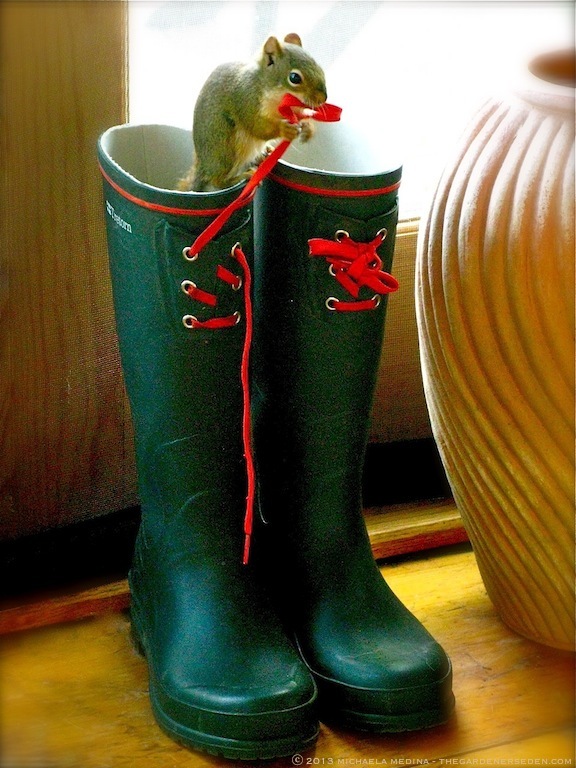 Now’s a good time to look over gardening gloves, bug nets, jackets, boots and other gear. Something need mending or replacing? This is the last chance to prepare. 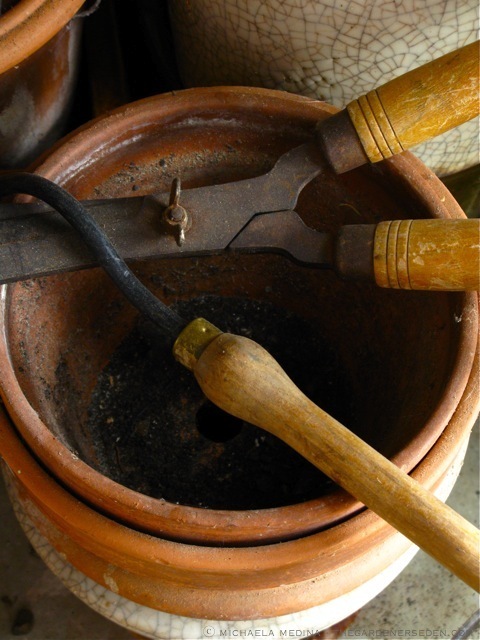 In late March and early April, I like to sharpen and oil my garden shears and other tools before the big spring clean up begins. And while I can still find a few free hours, I like to make time to organize and rearrange the garden/potting room. Culling unwanted items now means I’ll have less clutter to trip over later, when it’s time to move things back outdoors. Oh, and speaking of moving things outside . . . There’s that storage room packed with seasonal furnishing! It’s time to clean, sand and rub down those wooden tables and chairs with a fresh coat of teak oil. I’ll want them back on the terrace as soon as possible. After all, you never know when a warm evening might inspire a spontaneous, al fresco meal. 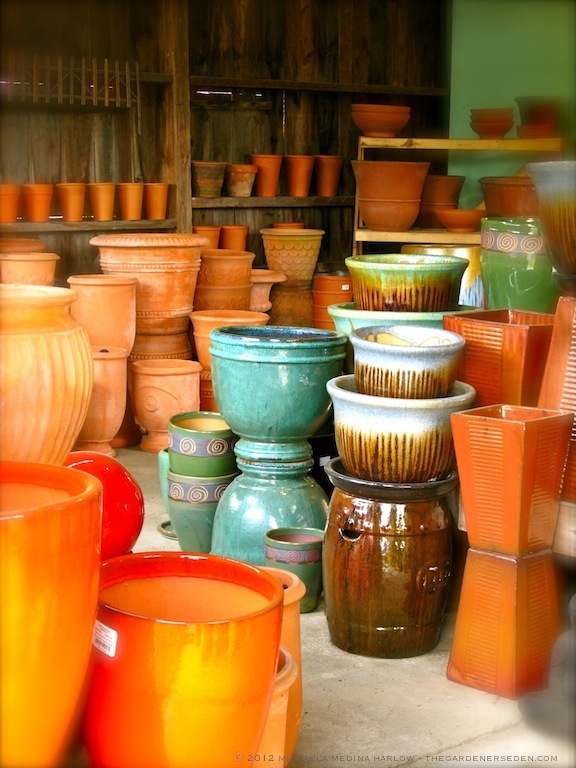 And as the temperatures rise —and after I finish cutting back, cleaning up and rough raking the beds and borders— I’ll swish out my heavy, glazed containers and water bowls, returning them to their outdoor places. 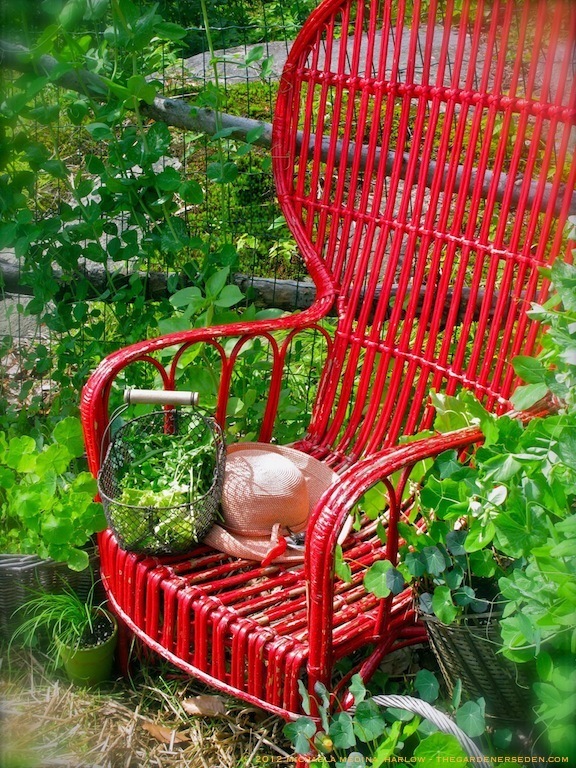 If only for a few moments here and there, it sure is great to get back into the garden! 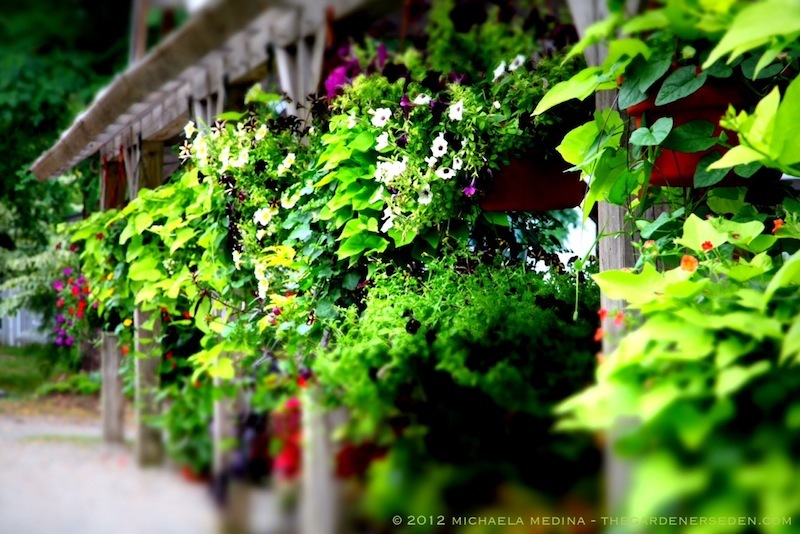 You are currently viewing the archives for April, 2013 at The Gardener's Eden.